Lecture: "Guardians & Gunboys: Domestic Labor, Kinship, and Soldiering for Imperial Armies, ca. 1870-1918"
Soldiers in imperial armies relied on members of their households for domestic and other forms of labor, whether in garrison or in battle. Kinship, constituted in various ways, formed the basis of these labor relationships, interlacing the intimacies of domestic life with the work of soldiering. This talk examines evidence drawn from different imperial contexts—German East Africa, Sudan, and the United States—between roughly 1870 and 1918, to show how similar labor patterns shaped imperial armies. 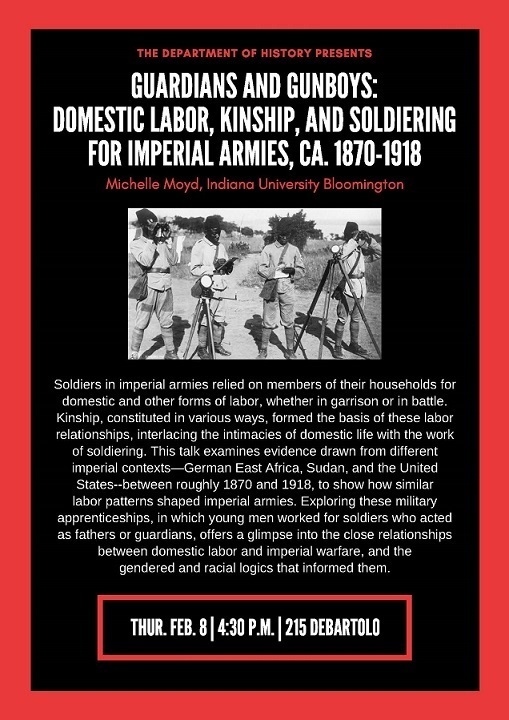 Exploring these military apprenticeships, in which young men worked for soldiers who acted as fathers or guardians, offers a glimpse into the close relationships between domestic labor and imperial warfare, and the gendered and racial logics that informed them.